Oman, an Arab country in Southeast Asia on the Southeast coast of the Arabian Peninsula bordered by United Arab Emirates, Saudi Arabia, Yemen, Arabian Sea, and the Gulf of Oman has a total land area of 119,498 square miles and a population of around 2.85 million. 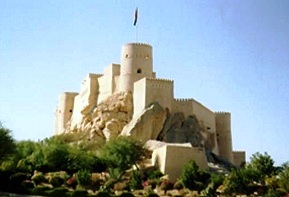 Oman is often considered as the most developed and stable country of the Middle east. Its terrain consists of desert plains, mountain ranges and coastal plains and its climate hot and dry in the interior and humid along the coast. The major sector of its economy is oil and contributes to its standard of living. Its health-care is ranked as the 8th best in the world. The dwindling oil reserve has placed emphasis on adding new segments to the economy. As agriculture (coconut, frankincense, dates, limes and grains) is not expected to shore up the economy, tourism is considered as the best bet. The best time to visit Oman is from October through March. The major tourist attractions are the Al Jalali and Al Mirani Forts, Al Alam Royal Palace, and the Sultan Qaboos Grand Mosque in Musact, and the various museums including the Oman Natural History Museum. The wadis, deserts, beaches and mountains are the natural attractions of the land. Its desert terrain is home to a variety of indigenous mammals and birds including the Arabian tahr. The popular tourist activities include adventurous sports like sand skiing, scuba diving, surfing, trekking, and rock climbing, and moderate ones like bird watching, cave explorations and camel races. Festivals are held at various timeas and visitors tend to time their visit around them. Fish, chicken, and mutton are consumed on a regular basis and are seasoned with herbs, spices, garlic, onion and lime. Maqbous, arsia and nashuai are some of the popular traditional dishes. Lonely Planet Oman, UAE, and the Arabian Peninsula 978-1741791457 $22 Best reference travel book to the area. Includes 76 maps. Oman is covered in 35 pages. Oman and United Arab Emirates Map 978-1553413561 $12 1:1,400,000 Scale. Includes Inset Maps of Dubai and Central Muscat. The first stamps of Oman were a set of fifteen stamps released on November 20, 1944 that were overprints on King George V (KGV) issues of India from 1937-1940. The set (Scott #1 to #15) catalogs for around $20 MNH and around $80 used. The set was followed on April 1, 1948 by a set of nine stamps that were surcharge overprints on stamps of Great Britain. That set (Scott #16 to #24) catalogs for around $20 MNH and around $30 used. Surcharge overprints on Stamps of Great Britain were the primary issues of Oman during the period till 1966. Chief among them were a long set of fifteen stamps released between 1960 and 1961 that were surcharge overprints on Great Britain Stamps from 1958 to 1960. The set (Scott #79 to #93) catalogs for around $100 MNH and around $70 used. The country was known as the Sultanate of Muscat and Oman during the period from 1944 to 1971 when it was renamed as the Sultanate of Oman. The first original issues of the Sultanate of Muscat and Oman were a set of twelve stamps released on April 29, 1966 showing local scenes. The set (Scott #94 to #105) catalogs for around $75 MNH and around $25 used. The designs show Crest, View of Harbor, Nakhal Fort, Baizas, Samail Fort, Sohar Fort, Nizwa Fort, Matrah Fort, and Mirani Fort. The same set was reissued with different colors and denominations on June 27, 1970. That set (Scott #110 to #121) is even more valuable and catalogs for around $140 MNH and around $25 used. In the interim a set of four stamps (Scott #106 to #109) was also released to mark the first oil shipment from Muscat and Oman in July 1967. The set featured Mina al Fahal Harbor, oil tanks, oil installation in the desert, and View of Arabian Peninsula from Gemini IV. This set is also sought after and catalogs for around $25 MNH and around $5 used. A set of twelve stamps released on January 16, 1971 that were ‘Sultanate of Oman’ overprints on the 1966 long-running set. The set (Scott #122 to #133) catalogs for around $150 MNH and around $30 used. A variety in parts of the set that feature a high, thin crossbar on the letter “A” is rare and valued upwards of $50 each. The set was followed by another variety between 1971 and 1972 that featured surcharge overprints on a subset of the original set. That set (Scott #133A to #133C) is very valuable and catalogs for around $350 MNH and around $15 used. A set featuring Views and certain varieties issued between 1972 and 1982 is considered the most recognized stamps of Muscat. The sets (Scott #139 to #150, #139a to #146a, #139b to #150a) are valuable and sought after cataloging in the 10s of dollar range for MNH and between $10 and $20 for used. The views depicted are Muscat, Matrah, and Shinas. A set of six stamps released on November 18, 1975 to mark the National Day. The set (Scott #162 to #167) catalogs for around $20 MNH and around $5 used. The designs show New Harbor at Mina Raysoot, stadium and map of Oman, Water Desalination Plant, Oman Color Television Station, Satellite Earth Station and Map, and telephone, radar, cable, and map. National Day issues are a good collectible theme on stamp issues of Oman. A strip of six stamps released on July 29, 1987 in the Pilgrimage to Mecca theme. The set (Scott #302a-f) catalogs for around $16 MNH or used. The designs show the different stages of pilgrimage: pilgrims walking the Tawaf, circling the Holy Kaaba seven times, Tent City of Mina, symbolic stoning of Satan, pilgrims in Muzdalifah at dusk, picking up stones, veneration of the Prophet (pilgrims praying) at Medina, and pilgrims wearing Ihram at Pilgrim’s Village in Jeddah. A set of two stamps and a souvenir sheet of two released on November 18, 1995 in lithographed and embossed Granite paper to mark the 25th National Day. The set (Scot #376 to #377 and #377a) catalogs for around $5 MNH or used. The designs show portraits of Sultan Qaboos in traditional attire and military uniform. The first coins of Oman were Baisas issued in 1946. Prior to this, the Indian Rupee along with the Maria Theresa Thaler were used as currency. Sultanate Decimal Coinage (1000 new Baisa = 1 Saidi Rial) Gold Rial Proofs were introduced in 1971. The issues had very low mintage (100) and catalogs at a premium to bullion value. Oman has released a number of gold proofs specifically stuck for the numismatic market and presentation purposes over the years. Coins $1 and up Baisas from the 1970s onward in BU starts around $1. 1995 Silver FAO Proofs, Baisa Year Sets, etc start around $15. 1995 UN Silver Proofs and other low mintage Silver Proofs start around $50. Gold Proofs from the 1970s onward, Silver Proof Bird Set of 2009, etc go well into the 100s. Paper Money $2 and up Common UNCs starts around $2. Rare Dates, Consecutive Serial Number UNCs of 5-pieces or more, etc start around $20. First Issue UNCs, UNC Bundles, etc starts around $50. Low Serial Numbers, Early UNC Bundles, Rare Early Specimens, Early Full Year sets, etc go well into the 100s. Arabian rugs, incense burners, wooden handicrafts, sheesha pipes, ornate khanjars, and baskets are popular souvenirs of the place. Miscellaneous Collectibles $5 and up Patches, Magnets, Cypraea Teuleri’s etc start around $5. Larger Meteorite samples along with rarer Cypraea Teuleri’s start into the 50s.